Unlike most popular books on climate change, it is not a polemic or a collection of anecdotes and exhortations. In fact, with the exception of a few thoughtful essays scattered throughout, it’s basically a reference book: a list of solutions, ranked by potential carbon impact, each with cost estimates and a short description. A set of scenarios show the cumulative potential. It is fascinating, a powerful reminder of how narrow a set of solutions dominates the public’s attention. Alternatives range from farmland irrigation to heat pumps to ride-sharing. 2050 — more than on– and offshore wind power combined (99 GT). Read more here. [Wind turbines are ranked #2 and solar farms #8]. 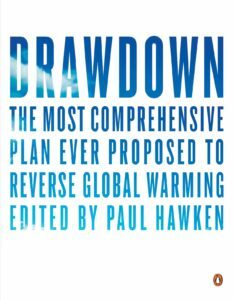 This entry was posted in NewsBlog and tagged David Roberts, Drawdown, global warming solutions, Paul Hawken, Vox on May 10, 2017 by Helen Deffenbacher.